COWBOYS coach Paul Green doesn't believe his prolonged contract talks has been a distraction for his side after their horror start to the year. But he conceded his settled future will clear the way for the squad to focus totally on completing a rescue mission which is yet to be achieved in NRL history. Green re-signed for another three seasons today, which gives the club welcome stability as they look to snap a five-game losing streak. 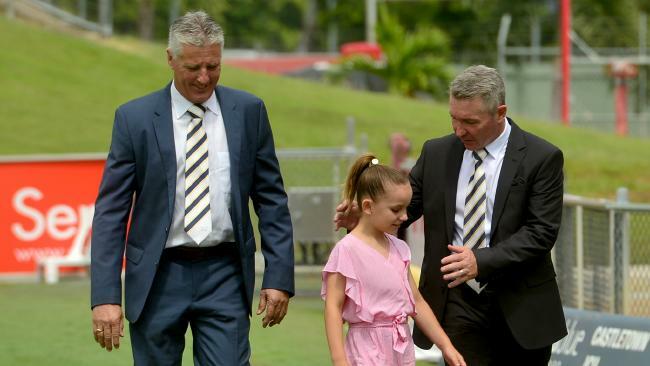 The 45-year-old said he is looking forward to the challenge of ensuring the club stays successful after Johnathan Thurston retires at the end of the year, and other key players are in the back end of their careers. On face value, Green's prolonged negotiations had the potential to divert the player's attention from the task at hand. But Green insisted it hasn't been a factor behind their 1-5 start, a record no NRL team has recovered from to make a grand final. "I don't think so. The players might have a different opinion but I've been open and honest with them the whole way through," Green said. "I told them if they've got any questions about where it's heading to come and see me, and none of them have. "If it is a distraction, now it's off the table for us and now we can get our heads around playing the best footy we can. "For me, it wasn't an issue. I've been through these processes as a player and coach for a long time now. "I didn't feel it was affecting the job I was doing, but it's something we can stop talking and worrying about now, and we can focus on the team." Green's re-signing should also help the club accelerate the process of negotiating with key players off contract. Jake Granville, Justin O'Neill, Lachlan Coote, Antonio Winterstein, Kane Linnett and Ethan Lowe headline the list of stars who are yet to commit beyond this year. "It will give us clarity around where we're going in the future," Green said. "Anyone who is off contract, now we've sorted this out, they know where the club's heading from. Whether that helps you'll have to ask the players, but hopefully it does." Green is confident Cowboys have the plans in place to remain an NRL heavyweight without four-time Dally M medallist Thurston. Handling an ageing roster and blooding new talent into the squad looms as the biggest challenge for the 2015 premiership-winning coach going forward. "When any club has a player such as JT going through that retirement process, how you handle that can be challenging," Green said. "I am looking forward to it and I think we're well placed to handle that."